American soybean farmers are worried about their best customer. China was the United States' largest buyer last year, gobbling up $12.3 billion worth of soybeans, according to the Department of Agriculture. 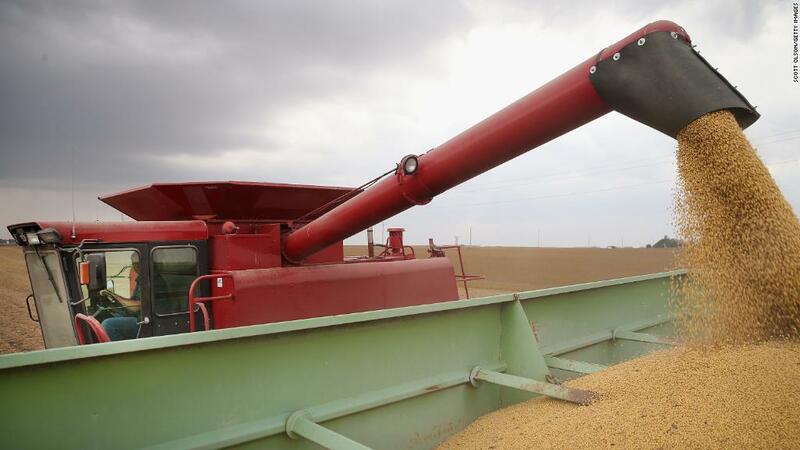 But China is planning to make US farmers pay a 25% tariff to sell beans in the country in retaliation for President Trump's proposed tariffs on Chinese goods. Chinese tariffs would hit farm states and more than 300,000 soybean jobs. Illinois, Iowa, Minnesota, Indiana and Nebraska were the largest soybean producers in 2016, according to the Agriculture Department. "For those farmers that are operating on thin lines of profit and credit and are already financially unstable, it easily has the ability to be the straw that breaks the camel's back," said Brent Bible, who grows soybeans and corn on 5,000 acres in Lafayette, Indiana. Bible is also a member of Farmers for Free Trade, a group that opposes Trump's tariffs. China has "the ability to be stubborn for a lot longer than we can remain solvent," he said. Tariffs would cause Bible to re-evaluate his planting strategy and possibly cut back on growing soybeans. "Do I want to plant a crop that looks more likely [to] lose money?" he wondered. Soybeans are America's leading agricultural export, with $21.6 billion in sales last year. Nearly 60% of the beans went to China, followed by Mexico and Japan, according to Panjiva, a research firm. American soybean production exceeds this country's demand for the crop, forcing producers to look overseas. More than half of the US soy crop is exported every year, according to the American Soybean Association, an industry trade group. China has been an eager buyer. Chinese companies buy raw beans from US producers and crush them up to use as a protein source in animal feed. The average soy bean seed is 36% protein, said Bill Nelson, an economist at Doane Advisory Services. Soybeans are also processed into cooking oil, used for diesel production and blended into foods like tofu and milk. China is "trying to improve the diet of the average Chinese person. That has involved a phenomenal increase in the amount of protein meals they are consuming," Nelson said. Farmers have benefited as China puts muscle on pigs, cows and chickens with the help of US soybeans. US bean exports to China have nearly tripled in the past decade to 32 million tons, according to the Agriculture Department. But Brazil has overtaken the United States as China's largest soybean importer, and tariffs targeting American beans could widen Brazil's lead or boost Argentina, the third largest supplier to China. Tariffs would make US beans less competitive to Chinese buyers and Brazil's crop more attractive. "World demand will remain roughly the same, but all these extra expenses will have to pass through," Nelson said. "Farmers are going to be the victim." Brazil has already ramped up its crop for 2018, and its beans are slightly richer in protein than the United States' -- points that "likely underscore the Chinese government's confidence to retaliate," Barclays' Adam Seiden wrote in a note Wednesday. Weather can influence soybeans' protein proportion, and Brazil has experienced warmer seasons, Nelson noted. Kevin Scott, a fourth generation farmer in Valley Springs, South Dakota, said a 25% tariff to sell in China would lead to Chinese buyers offering lower prices for his beans. Scott estimated that would dent his annual profit by up to $100,000. "We're at break even. We've not been doing extremely well for the last four years," Scott said in an interview. "There would be a lot of farmers that would have to quit what they do" if Chinese tariffs went into effect before peak demand begins in September. Lower prices on soybeans might actually help major US protein companies, Aslam noted. Shares of Tyson Foods (TSN), Hormel Foods (HRL), Sanderson Farms (SAFM) and Pilgrims Pride (PPC) all rose Wednesday. But Scott said the tariff threat will rally farmers and growers to push back hard in Washington: "This will fire us up." Advocates for the soybean industry are already sounding the alarm, and lawmakers in farm states hear it. "Farmers and ranchers shouldn't be expected to bear the brunt of retaliation for the entire country. It's not fair, and it doesn't make economic sense," Iowa Republican Senator Chuck Grassley said in a statement. The Trump administration should "mitigate the damage it caused," Grassley said. Chinese tariffs "will have a devastating effect on every soybean farmer in America," American Soybean Association President John Heisdorffer said in a statement. The group said that a 40-cent drop in the price of soybean bushel futures Wednesday had cost farmers $1.7 billion in crop value. For Bret Davis, a farmer in Delaware, Ohio, and a member of the trade group, that amounted to a $35,000 loss.